Leon "Pee Wee" Whittaker grew up in a musicial family. Born an only child in Newellton, Louisiana, he learned how to play several instruments over his lifetime, but he was remembered most as a trombonist. 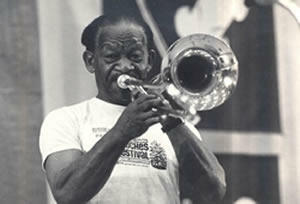 In 1935, Whittaker and his horn took off to Monroe, Louisiana and joined the band Rabbit Foots Minstrels. During his time with the band he toured up and down the Mississippi River.